Harvet Tips for Moldy Corn! 1. Prioritize your corn harvest and storage. If producers have clean corn still left on the farm, it is important to not mix it with potentially moldy corn from the new harvest. Livestock producers, especially hog, will want to scout fields, sample and test for mycotoxins in order to store their cleanest corn for feeding purposes. Cash croppers are advised that the same process of keeping clean corn segregated from moldy corn may result in some increased future marketing opportunities. 2. As a general rule, harvest infected fields early. Mycotoxin levels have the potential to build the longer you leave the corn in the field. Once corn moisture is below 18%, mold fungi become dormant and cease to produce mycotoxins. 3. High temperature drying stops mold growth (optimum temperature for mold growth is 28°C, mold stops growing at >30°C) and mycotoxin production but does not reduce mycotoxins already present. Quick drying is preferred over low heat drying. Be wary of low temperatures in bin dryers for moldy corn and be sure proper ventilation requirements are met for storing dry corn. 4. Leave tip kernels attached to the cob if possible by running the combine at full capacity with concave settings open and cylinder speed set low. Screens on the bottom of the grain elevator, the bottom of the return elevator and on the unload auger will also help screen out the fines. 5. Set the combine to provide high levels of wind to blow out the lighter infected kernels. 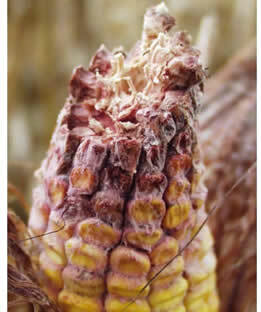 Gibberella (F. graminearum) infection results in lower kernel stability, resulting in higher incidence of mycotoxins in fines (kernel tips and red dog) and cob pieces. Be careful that combine adjustments do not result in kernel damage. The sample could be downgraded and increases potential storage problems. samples with low to moderate mycotoxin levels. could affect cattle. Sampling of corn silage for mycotoxins in seasons of mold presence is recommended. Figure 1. Tip kernels are often the most infected and have the highest concentration of vomitoxin. Combine set-up and grain cleaning should attempt to keep these from entering the clean grain.